It’s the eve of Independence Day 1876, and Patrick and Sissy are running for their lives. 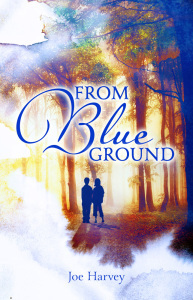 Their only hope lies in unlocking the mystery of a stone that emerged From Blue Ground. Patrick and Sissy Hughes are fleeing their father’s murderer. They carry with them a wooden box retrieved from a secret compartment beneath their father’s bed. His dying words to them: “keep it safe, keep it hidden.” Powerful men are looking for what’s inside, and they will do anything they can to get it. Set in 1876 in the coal hills of Pennsylvania, From Blue Ground follows the two unwitting orphans as they make their way to Philadelphia, where large crowds have gathered at the Centennial Exhibition. Their father had promised to take them there for the Independence Day celebration. Instead, they are running for their lives. Alone and on the run, they are pursued by James McKenna, their father’s murderer, a rogue Pinkerton Security Agent working undercover for the Philadelphia and Reading Railroad. Patrick and Sissy’s only hope is to unlock the mystery of the contents of the box: a diary, a translucent blue stone, and a bag of blue ground. As they make their way to Philadelphia, their pursuers grow in numbers and Patrick and Sissy must fight against time and the odds to stay together—and alive. Available for purchase at the retailers below!